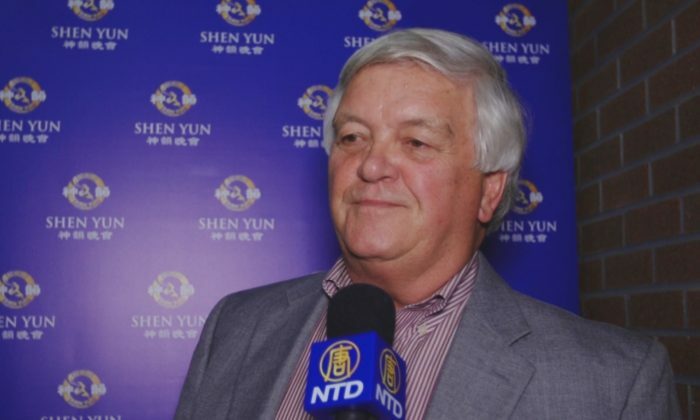 JACKSONVILLE, Fla.—Local business owner Don Dymer, who has traveled to China in the past, was glad to learn more about China’s history and traditional culture Saturday evening, Jan. 24, at the Shen Yun performance. “It really presents China in a wonderful way,” said Mr. Dymer, who saw Shen Yun Performing Arts at Lazzara Performance Hall, University of North Florida Fine Arts Center. “This is doing a great job explaining what it is that goes on in China and the history,” Mr. Dymer said. He came to see Shen Yun Performing Arts because he had heard the performance is entertaining and educational. According to Shen Yun’s website, the company aims to revive the heritage of China’s 5,000 years civilization. “I am impressed. I think the choreography and the whole story-telling piece is very unusual and is really something,” Mr. Dymer said. Through classical Chinese dance, Shen Yun presents stories and legends from Chinese history as well as contemporary times. The choreography of some Shen Yun dance programs fills the stage with many dancers. Accompanying Shen Yun dancers is a Western orchestra that incorporates several traditional Chinese instruments, such as the pipa, erhu, and suona. “It’s wonderful, and some of the instruments they are playing, we are hearing in the background,” Mr. Dymer said. He said he was touched by the performance, especially by the dance that shows people in China still lack freedoms enjoyed in the West. The dance The Power of Compassion, tells of persecution encountered in China by practitioners of the Falun Dafa spiritual discipline. Shen Yun completes its engagement in Jacksonville with two more performances on Jan. 25. The company will return to Florida in the spring with performances in Orlando, Fort Myers, St. Petersburg, Miami, and West Palm Beach.